A wise person once said “Life’s too short to not eat cake.” It’s a motto we abide to in Cornwall and just one of the reasons why there are cream teas around every corner, plus the fact they’re irresistable! It’s compulsory to indulge in a cream tea when on holiday in Cornwall after all – an unwritten law you might say (there exists one for the Cornish pasty too!). A cream tea is the perfect brunch, lunch, afternoon snack or welcome back if you’re returning to Cornwall. A relaxing day wandering around the charming coastal town of Fowey with family or friends wouldn’t be complete without one. But which eclectic café or wonky tearoom do you choose? From classy waterfront joints to small quirky cottages, there’s almost too much choice. This 15th century quirky tearooms will have you drooling at the first hurdle – its eye-catching window full of mouthwatering cakes is nothing short of heaven. The cakes are baked fresh every morning and there’s always a mind-boggling variety. There’s even a small walled courtyard where you can relax in the fresh sea air and give those tired feet a break after too much shopping. The delicious cheesecakes, tarts and tortes in the chilled cabinet aren’t half bad either. Opposite The Old Quay House, this ancient Tudor building turned family-run tearooms was built an unbelievable 80 years before Henry VIII came to the throne and half a century before Christopher Columbus discovered America!! That’s how old it is! It still has many original features like old beams and slanted floors (and walls!). It feels as if you’ve stepped back in time. The owner makes all her cakes on the premises and her husband cooks the dish of the day. An array of delicious ice-cream flavours may have you pondering an ice-cream tea?! 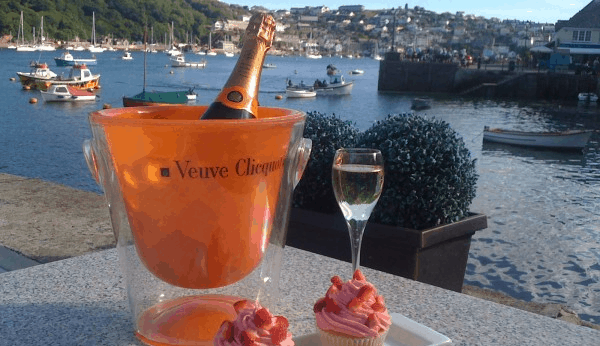 With some of the best estuary views in Fowey, The Old Quay House terrace on Fowey’s waterfront is a hard one to beat. Kicking back on the terrace, soaking up the sunshine while tucking into a cream tea made with local clotted cream and homemade sticky jam, is a recipe for a memorable afternoon in Fowey. Add a touch of glamour to the traditional cream tea with a glass of champagne – go on, spoil yourself, you’re on holiday! This funky fabulous café with its retro kid’s toys and old fashioned books is a good choice if you’ve got little (and not so little) children in tow. They once had a marriage proposal on the Etch a sketch and we have the photo to prove it. It’s a teeny weeny place but they do a big British breakfast (as well as other healthier options and excellent cream teas) to make up for it. Slightly out of the main hub but still on the main thoroughfare, this eclectic café is a bombshell of beach chairs and unfinished knitting. It’s casual, fun and dog friendly. Enjoy pinky’s ‘cream tease’ while you cast your eyes over the fascinating bits of art and colourful décor that go into making this place so unique. There you have it, our top recommendations for a great place to treat family or friends to a cream tea in Fowey. Just remember, the Cornish way is the best way – jam first then cream on top!